Holidaymakers come to Tuscany for various reasons. Many come for hiking or because of the beautiful beaches. Almost all make at least one day trip to one or more of the big cities of Tuscany with world famous sights. By far the most visited city in Tuscany is Florence. So are also below in the list 6 of the 10 sights in Florence. But also other cities like Siena, Pisa and Lucca are visited a lot. Tuscany tourists are often spoilt for choice. In the following list we have put together the 10 most important sights from our point of view in Tuscany. They are historical buildings and city squares. All 10 sights would also be among the top 50 sights in Italy. 1. Florence Cathedral: Florence Cathedral is one of the 10 most famous churches in the world. World-famous is above all the gigantic dome from the 15th century. Until today it is not quite clear how they could build such a gigantic building more than 500 years ago, although the technology for it was not invented yet. It is the largest historical dome on earth. One of the top 10 churches in the world. 2. Leaning Tower Pisa: The most famous tower in the world has been leaning for centuries. A few years ago it was erected again after the collapse threatened. Those who want to climb the Leaning Tower should buy tickets in advance, as only a limited number of visitors are allowed to climb it and this is usually sold out days or weeks in advance. 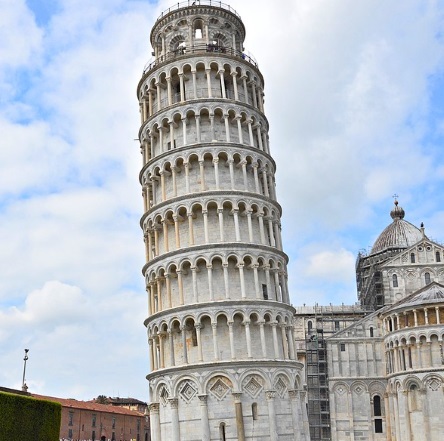 The Leaning Tower of Pisa is the church tower of the Cathedral of Pisa, which is also a great attraction of Tuscany. Perhaps the most famous tower in the world. 3. Uffizi Florence: The most important museum of Renaissance art in the world. Works by Michelangelo, Raphael and Leonardo da Vinci belong to the Uffizi collection. It is not only one of the top 10 sights of Tuscany, but also one of the top 10 art museums in the world. 4. Piazza del Campo in Siena is one of the largest squares in Italy and the centre of the city of Siena. In good weather thousands of tourists sit on the ground on the gigantic square. In historical surroundings you can meet people well. The Piazza del Campo belongs to the Top 10 city squares of the world. 5. Accademia in Florence: Another very famous art museum in downtown Florence. Like the Uffizi, it is one of the top 10 art museums in the world. The most famous statue at all, the David of Michelangelo, is the highlight of the museum Accademia Florence. 6. Ponte Vecchio in Florence: Next to the Rialto Bridge in Venice, the most famous bridge in Italy. On the bridge over the river Arno in downtown Florence are jewellers and other shops. 7. Cathedral of Siena: Next to the Cathedral of Florence and the Cathedral of Pisa, the third world-famous church in Tuscany. Great sights in the cathedral of Siena are among other things great floor paintings and an old library. One of the top 10 churches in Italy. 8. Palazzo Vecchio in Florence: In former times the seat of government of Florence was here, still today it is the town hall. Great halls and works of art, you should definitely visit the „Old Palace“. 9. City Wall Lucca: This is probably the largest monument of Tuscany. On a length of several kilometres, the gigantic city wall surrounds the old town. On the wall there is a wide path, you can walk or cycle around the old town of Lucca on the city wall. 10. Palazzo Pitti in Florence: On the other side of the river Arno, just outside the city centre is the gigantic Palazzo Pitti. Today there are some famous museums in the palace, among others an important art museum. This is one of the reasons why it belongs to the top 10 sightseeings of Tuscany. The great sights of Tuscany cost a large part of the entrance fee. Only the city walls of Lucca, the city square of Siena and the bridge Ponte Vecchio in Florence can be visited from our list of the top 10 sights of Tuscany without a ticket. 1. 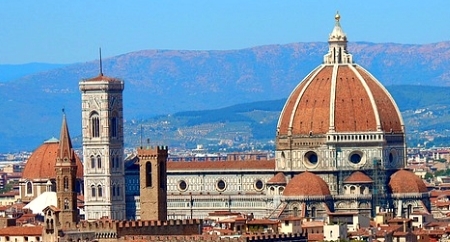 Cathedral of Florence: You can visit the Cathedral itself, the Baptistery and the Krypta and climb the Campanile. There is a ticket for about 15 Euro. But we also recommend a walk to the world-famous dome. This is only possible in a guided tour, which can be pre-booked with date and time on this website (total costs including church visit, museum etc. about 45 Euro per person). In the summer (high season) you should book the walk on the world-famous cathedral dome if possible weeks before. 3. Uffizi Florence: Due to extremely long queues, tickets for the Uffizi Florence should also be purchased in advance on the Internet for 20 euros. Even during our last visit in January, all in the absolute low season, the queues in front of the cash desk in the late morning were about 200 meters long. In summer, of course, there are even more people waiting at the Uffizi. It is one of the most visited museums in the world. On this link you can find the tickets for the Uffizi on the internet. 4.Piazza del Campo Siena: The most beautiful square in the world, as many say, is free of charge. It is the central square in Siena. 5. Accademia Florence: Also here the waiting times are enormous, similar to the Uffizi. It is also recommended to buy the tickets for the art museum Accademia with the statue „David“ by Michelangelo online for about 16 Euro in advance in order to avoid long queues. On this page you can buy tickets for the Accademia Museum..
6. Ponte Vecchio Florence: Public bridge, no entrance fee or ticket, open 24 hours. 7.Cathedral of Siena: Similar to the other two large churches in Florence and Pisa, there is also a total ticket for all attractions for the Cathedral of Siena. The ticket for around 17 euros is valid for a visit to the Cathedral itself, the famous Piccolomini Library, the Krypta, the Cathedral Museum and the Baptistery. Here you can buy your tickets on the Internet. 8. Palazzo Vecchio Florence: Even at the Old Palace the queues are often long during the season. Also for the Palazzo Vecchio we recommend the purchase of the tickets before with Getyourguide.de for 19 euro or 25 euro inclusive tower ascent. 9. City wall of Lucca: The several kilometers long way on the old city wall of Lucca goes around the old part of town and is freely accessible day and night. Thus, you do not have to pay anything. 10.Palazzo Pitti Florence: Here the snakes are usually not so long, you can buy the tickets locally. A ticket for all museums in the palace costs approximately 13 euros. Guided tours are also great, you should book them on this website in advance.